A little about the Watercraft Insure Agency. We are an agency specializing in watercraft insurance. Whether you own a personal watercraft, pontoon, sail boat, performance boat, an antique or classic boat, a cruiser or a yacht, we have the expertise to explain the various coverage options available from the leading boat insurers. We own and operate boats ourselves and have the knowledge and training including having Certified Marine Insurance Specialist designations. We also concentrate on finding you the very best pricing. We are independent agents and unlike many other agencies, we have multiple companies to compare with. Our team of Certified Marine Insurance Specialists understand boats and can explain the many different coverages that are available. We also insure most other recreational products like motorcycles, ATV’s, golf carts, side-by-sides, snowmobiles, travel trailers and motorhomes. We are licensed from Alaska to Maine, and we write watercraft insurance in over 30 states! Representing the finest boat insurance companies in America, we do the shopping for you to find the best possible price. Let’s face it, boating is not inexpensive recreation! Let the experts at Watercraft Insure protect your money and investment at the lowest possible price. This strategy of finding great boat insurance coverage at the lowest possible cost has been the key to our phenomenal growth and success. Complete an application and find out how much you can save! Did you know: Water Craft Insure also offers motorcycle, side-by-side, atv and snowmobile insurance? Why choose Water Craft Insure? Follow Water Craft Insure online. Join our fantastic community! Follow us out on FaceBook and YouTube! Get tips, watch videos, upload your water craft photos and more! People have different insurance needs, depending on the value and use of the boat,which is why we offer a variety of packages and specialized coverages. Most people are concerned with the amount of coverage to repair or replace the boat after a loss along with decent limits of liability coverage, others are looking for saver packages which are perfect for the price-conscious shopper who want basic coverage at an affordable cost. We can usually tailor a specific package to meet your needs while eliminating some expensive coverages that may never be necessary. Apply today and get the coverage you need at a great price! Some other optional coverages can include medical payments (that cover you and your boating guests potential medical expenses), personal property coverage, emergency service & towing, emergency haul-out, trip interruption, pollution liability, pet coverage, watercraft trailers, boat lifts and uninsured boater bodily injury . Please keep in mind that half of all boaters do not have insurance! Uninsured Watercraft Coverage covers you and you passengers for bodily injury should an uninsured boat collide with you. It can also include bodily injury for a hit-and-run accident where the party at fault is unknown. All policies will include some level of liability coverage. This will cover bodily injury to others, including guests, as well as liability for damaging someone else’s property as a result of a boating accident. There are many types of boating accidents and mishaps than can result in you being held liable. Passengers can fall or get seriously injured getting on and off your boat. There are swimmers that can be struck as well as other boats that can collide with your vessel. Some policies exclude water-sports liability, so it’s a very important to make sure you’re covered if you plan on any watercraft recreation such as water-skiing, wake boarding or pulling a tube. Liability coverage also covers your liability to government agencies for wreck removal and fuel spill clean-up liability. Some of our deluxe policies include coverage up to the OPA Federal Limit for pollution cleanup and site restoration of $854,400. It is usually relatively inexpensive to increase these limits. If you happen to have a personal umbrella policy then higher liability limits are required usually at a minimum of $250,000 Bodily Injury per person, $500,000 per accident and $100,000 in property damage liability. Be sure to ask us the price for higher limits. It’s not much more money to help protect your assets should you get sued in court as a result of a boating accident. It’s important to know which way a company will settle your loss. New boats can qualify for Total Loss Replacement Coverage . This coverage replaces your watercraft with a brand new boat in the event of a total loss. Agreed Value settlement pays you an agreed amount of money and is listed on the policy’s declarations page. In order to get this amount you are required to replace the watercraft within a specified amount of time. Somewhat older boats, usually older than 10 to 15 years, as well as some less expensive "saver" policies pay the Actual Cash Value of the boat at the time of loss. Medical Payments. This optional protection covers co-payments, deductibles and other expenses if you or someone else riding your covered water craft needs medical attention as a result of a water craft incident. Limits are available from $1,000 each person to more than $10,000. Accessory Coverage. This is coverage for items or extra equipment installed on the water craft for things such as special paint, wraps, engine performance equipment, studs, bags, GPS. You can purchase this coverage up to many thousands of dollars on a water craft quite inexpensively. Water Craft Trailer Coverage. Provided you purchase both comprehensive and collision coverage on at least one of the water crafts on you policy, we can schedule comprehensive and collision coverage on your water craft trailer. Trailers usually have a low $250 fixed deductible. Uninsured / Underinsured Motorist Bodily Injury Protection. In most states you can purchase this coverage up to your Bodily Injury Liability limits. This valuable coverage covers yourself or someone riding your water craft for their bodily injury and financial loss resulting from some other water craft that hits you and has no insurance or limits of liability less than your own policy. Lots of Discount Possibilities. We offer many ways for you to save money and you're not limited in the number of discounts you can enjoy. Depending on which insurance company we place you with, discounts can include: insuring two or more watercraft on the same policy, boating experience discounts, renewing your policy with us, owning your own home and completing a boater’s safety course. Having another recreational product insured with us besides your boat can earn you a multi-policy discount. Payment Options. You can pay your watercraft policy with a check or credit card. Monthly payment plans are also usually available. Fast and Reliable Claim Service. Report your boating accident any time, day or night. You willhave a toll-free phone number and all of our insurance companies have 24/7 claims service! Coverage in 31 states and growing! How can I get a watercraft insurance quote from Watercraft Insure Agency? You can get your insurance quote by calling our friendly insurance professionals at 1-518-725-7000 or by applying via our secure online form. Why is price not the most important factor when considering boat insurance? No two boat insurance policies are alike. If you experience a loss, you may not get what you expected. Our agency uses only companies who specialize in marine coverage and our agents have the expertise to explain all the important coverage's you will likely need in the event of a loss. What states require that I have boat insurance on my boat? No state requires boat owners to carry insurance on a pleasure boat. Most marinas will require that you have liability coverage on your boat. Also if you have a loan on a boat the lender will usually require insurance in order to protect their interest. All boat insurance policies have a navigational territory. You must stay within the navigational territory in order to remain covered. You can travel outside the navigational territory if you get permission and an endorsement from the insurance company. What other products does the Watercraft Insure Agency specialize insuring? We specialize writing insurance on anything fun. This includes ATV’s, Motorcycles, Side-By-Sides, Snowmobiles, RV’s, Travel Trailers, Fish Houses, Manufactured Homes and Motor Homes. We usually can save you money on these money on these policies as well! Writing a second policy with us may also reduce your watercraft insurance premium cost by earning you a multi-policy discount! Is anyone I allow to drive my boat covered? Yes, generally anyone you give permission to operate your boat is covered. However there are exceptions. If the boat policy has a Named Operator Endorsement, then only the named operators are insured. These endorsements are common on high performance boats. Marine professionals operating your boat are not covered since they should have coverage for your boat under their commercial policy. Where do I take my boat if it is damaged? You are always allowed to take the boat to the repair facility of your choice. What can I do to save money on my boat insurance premium? There are many factors that affect your boat insurance premium, such as where you use the boat. Generally coastal areas cost more than inland areas. Also areas subject to hurricanes cost more and have higher deductibles. You can save money by completing a boater’s safety course. Higher hull deductibles can save you money as well. Older boats and high performance (go-fast boats) usually pay higher premiums. In what states does Watercraft Insure write coverage for boats? 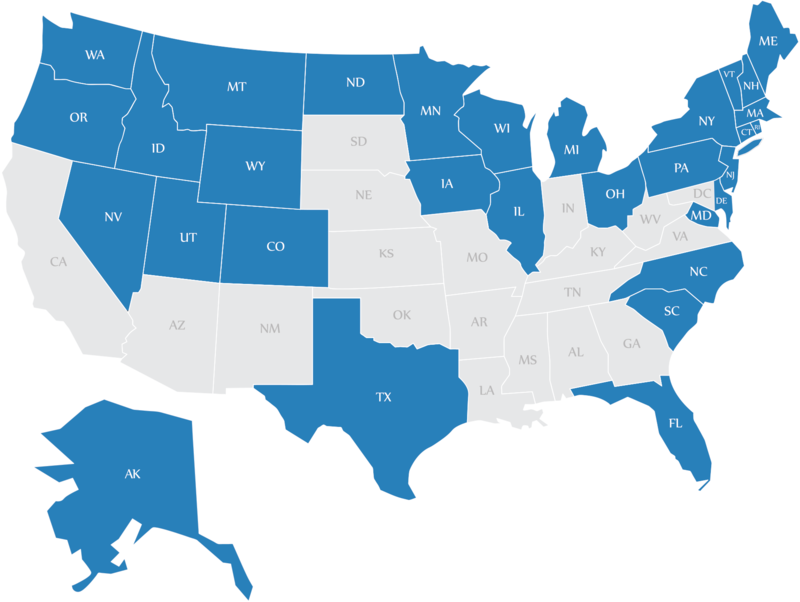 Currently our coverage area includes Alaska, Colorado, Connecticut, Delaware, Florida, Idaho, Illinois, Iowa, Maine, Maryland, Massachusetts, Michigan, Minnesota, Montana, New Hampshire, New Jersey, New York, North Carolina, North Dakota, Ohio, Pennsylvania, Rhode Island, South Carolina, Utah, Vermont, Wisconsin, Wyoming. We will be adding more states soon! Is my boat covered during the lay-up period? Yes, the boat is fully covered including theft, but the vessel must be out of commission (winterized), cannot be operated and cannot be used to live aboard. What is covered under Emergency Service and Towing? Towing provides coverage to the nearest place where repairs can be made. Emergency Services include the delivery of fuel or jump starting a dead battery. Is my boat covered if it falls off the trailer? Yes. The boat insurance policy provides all physical damage to the boat while on the trailer. Liability coverage always falls on the automobile insurance policy. How is my boat covered when on my trailer and attached to my vehicle? Any physical damage to the boat is covered by the boat insurance policy while on the trailer. If the trailer and/or the boat causes bodily injury to a third party, this damage is covered under the automobile insurance liability. Boat insurance policies do not pay for liability to others when the boat and trailer are connected to a vehicle. If you have any other questions or need further assistance please feel free to contact us by calling our friendly water craft insurance professionals at 1-518-725-7000. Don't wait, get a free quote today! Get a quote by phone. Have questions or prefer a quote over the phone? Feel free to call our friendly insurance professionals at 1-518-725-7000. Applying for a secure quote online with Water Craft Insure is easy! Simply click on the "Apply Online for a Free Quote" button below to get started! Subscribe for tips, advice and more! We believe in privacy and will never share or sell your information. Success! Be sure to check your email to confirm your subscription! © Water Craft Insure Agency / First Credit Corporation of New York, Inc.